Intex has launched yet another Android Kitkat running device but this time it is a device having higher specifications compared to the earlier low budget Android Kitkat running devices. The latest device from Intex is the Aqua Amaze which is a device having a Octa core processor and running on Android Kitkat 4.4.2. It runs on Android Kitkat 4.4.2 and the device is powered by a 1.4GHz MediaTek MT6592M octa core processor along with Mali 450 MP GPU. The device has a 5-inch OGS IPS display with a screen resolution of 1280 x 720 pixels. The device has a 13MP primary or Rear facing camera with Flash and a 5MP front facing camera. The device comes with Dual SIM support and it comes with 1GB of RAM and 8GB of internal storage which can be expanded to 32GB using microSD card support. From the 8GB internal storage only 5GB of storage is free. The device is available in two colors of Black and light blue and it comes at a thickness of 7.6 mmm. The devices comes with a 2000 mAh battery which gives 7 hours of talktime and 10 days of standby time. The device is priced aggressively at Rs. 10,690 which is a competitive pricing for a device with the above mentioned specifications. If you are looking for a device running on Android Kitkat 4.4 at a price lesser than Rs. 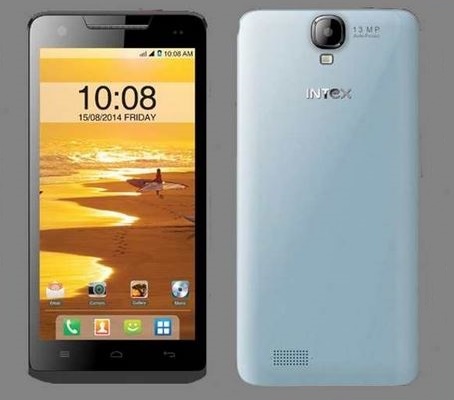 10,000 from intex you can check Intex Aqua Style Pro which is priced at Rs. 6,990 and Aqua Style which is priced at Rs. 5,990 also running on Android Kitkat 4.4 and sporting a 4 inch display. you can also check the Android One devices which are having similar specifications and running on stock android..